Africa’s biggest company also is one of its least well-known outside the continent, and it owes its fortune to one great investment: China. 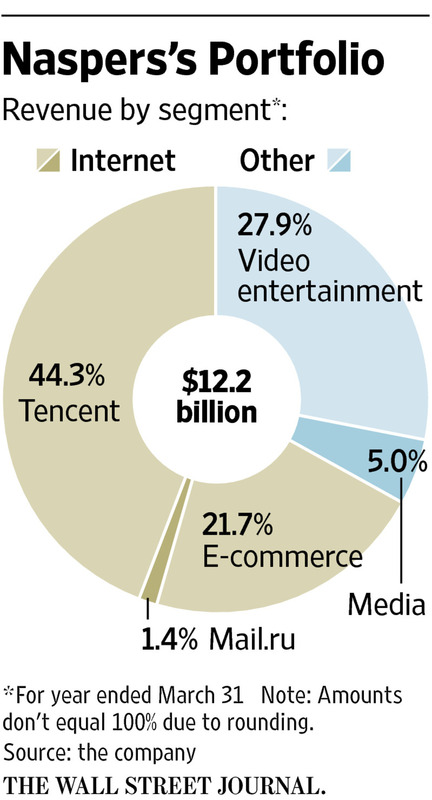 Naspers Ltd. , which has transformed itself from a local publisher to a media juggernaut valued at $76.5 billion, invested $34 million in 2001 to take a stake in Tencent Holdings Ltd. , now China’s largest and most popular internet-service portal with nearly a billion instant-messenger active users every month and a market capitalization of $256.7 billion. Naspers’s 34% stake currently is worth more than Naspers itself. Now, the media company is pushing into the U.S. and hoping to topple a household name, Craigslist Inc. In May, Naspers opened a venture-capital outfit in San Francisco to be closer to the tech-innovation hub of Silicon Valley and get early access to technology and internet companies it can help to scale on a global basis. That followed a $100 million investment last year in a mobile-classifieds app called Letgo. The company wants to replicate successes in online classified platforms in Russia as well as with OLX, the biggest classifieds site in India and Brazil, by dethroning Craigslist, which remains the industry’s most recognizable brand. 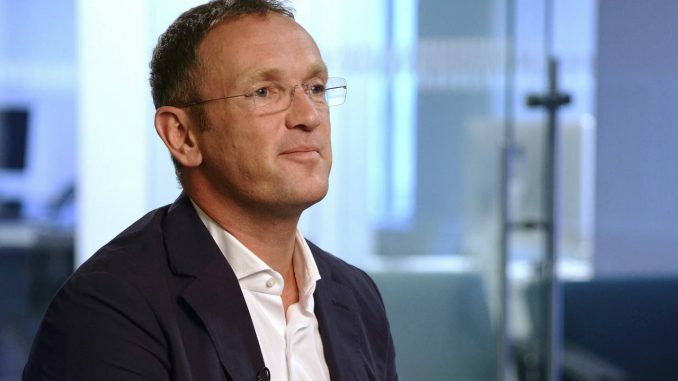 “The U.S. as a market is obviously extremely interesting; it’s also very crowded,” Naspers Chief Executive Bob van Dijk said in a rare interview for the tight-lipped company. “[Craigslist] is actually executed in quite a suboptimal way,” said the 43-year-old, who took over as CEO in April 2014 after working on the group’s e-commerce side and previously heading up eBay Inc. ’s German operations. “A mobile-oriented generation doesn’t really want to interact with a clunky ’90s website…That market I think is ripe for disruption.” Craigslist didn’t respond to a request for comment. Analysts say Naspers is undervalued, given that its market capitalization is less than the value of its Tencent stake, despite having additional profitable businesses. Naspers—which oversees more than 40 businesses, including pay television and online retail, spread across more than 130 countries—also has a 29% stake in Mail.ru Group, a Russian internet company that runs two of the country’s three-largest social-networking sites. In December, Naspers raised $2.5 billion to allow flexibility to invest in attractive growth opportunities during the next few years, including a controlling stake valued at $1.2 billion in Avito, an online classifieds platform in Russia. That business has been booming as Russians hit by an economic downturn buy and sell secondhand items on the site. Founded in Stellenbosch, South Africa, in 1915, Naspers was established as De Nationale Pers Beperkt, or the National Press Ltd., to produce a Dutch-language newspaper for the country’s Afrikaner population. The company and its publications became mouthpieces for the National Party, which came into power in 1948 and instituted the system of racial segregation known as apartheid. But Naspers has moved far beyond its roots as a publisher in apartheid-era South Africa. Although the company is still domiciled here, 77% of its revenue now comes from abroad and its media segment, which includes the print business, is by far its smallest. The emerging-markets-focused company also has set its sights on a lucrative new target: the U.S.
Naspers’s U.S. play is the latest in a series of bold moves for a company trying to prove that its success goes beyond one landmark investment. But Naspers’s e-commerce division, which includes classifieds and online retail, operates at a loss despite some profitable assets, such as Avito. The video-entertainment business, including sub-Saharan Africa’s biggest pay-TV provider, also has suffered after the global commodities crash weakened African currencies and consumer sentiment across the continent. For the year ended March 31, Naspers said the video business lost 288,000 customers and took a significant currency hit, because while it earns revenue in local currencies, it incurs a large portion of costs, such as sports rights and Hollywood films, in U.S. dollars. “That problem is not a fixable problem within a year,” Mr. van Dijk said. The poor performance in the pay-TV business prompted S&P Global Ratings to revise its outlook on Naspers’s triple-B-minus rating—one notch above the so-called junk status eschewed by many investors—to negative. In June, Naspers said its net profit for the year ended March 31 dropped 21% to $994 million. Still, core headline earnings, which are adjusted for nonrecurring and nonoperational items and are the company’s preferred measure of performance, were up 17% at $2.98 a share, driven by growth from the company’s internet and classifieds businesses. Naspers raised its full-year dividend 11% to 5.20 South African rand (37 U.S. cents), which executives called a vote of confidence in the long-term viability of the business.